In 1942 I lived in Bloomfield Crescent Odd Down with my parents. I was sixteen and working as an office boy at the offices of the Bath and Wilts Chronicle and Echo in Broad Street. I had also lied about my age to enable me to join the Home Guard as I was keen to get into uniform. 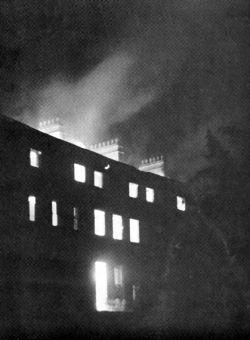 On the first night, the sirens had sounded and I thought Bristol was going to get it once more. It may be different now, but in those days when standing in the back garden one could see far enough to see bombs exploding in Bristol as well as the anti-aircraft fire. Also from the same spot one had a good view of most of Bath city. My Dad and I were doing that when an incendiary bomb fell into the flower bed not a yard from us. We quickly put the flames out with a shovel and some soil. 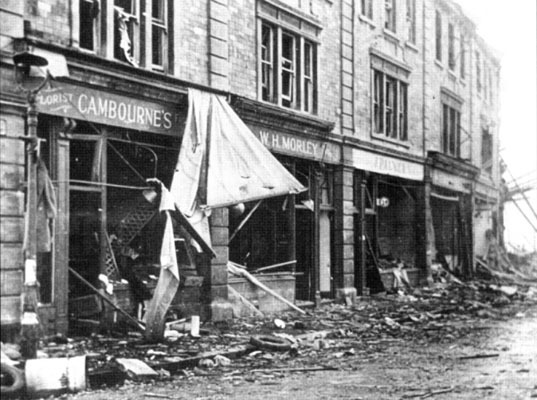 Then the high explosive bombs started falling and the German planes were flying over our house almost at rooftop level and then swooping down into the Bath valley. We were actually looking down onto the German planes they were so low. I heard that the planes were machine-gunning the streets apart from dropping bombs. I did not see that, so I am not sure. The German planes were so low that I considered "having a go" with the Home Guard rifle and twenty rounds of ammunition that I had in my bedroom but, on second thoughts, the chance of doing any damage was remote so decide that I would not do it. The bombs were dropping thick and fast by now and my mother persuaded us to go into the house. I went into the lounge and Mum and Dad got under the stairs, always thought the safest place in any house in those days. My Mother called me to join them under the stairs which luckily I did, because seconds later a bomb dropped somewhere near, and window glass was everywhere. It was very lucky that I had moved, because the wall near to where I was standing was peppered with shards of glass and I would probably have been badly cut. There was a field at the end of our road in those days so with the house damaged, we decided to go and sit in the field away from any building. It was a lovely night and mild and we sat there watching the German planes fly over our heads and down into the valley below. As I mentioned before, I was in the Home Guard and on the second night our unit received orders to be on duty at the Bear Flat to guard against looters on the second night. 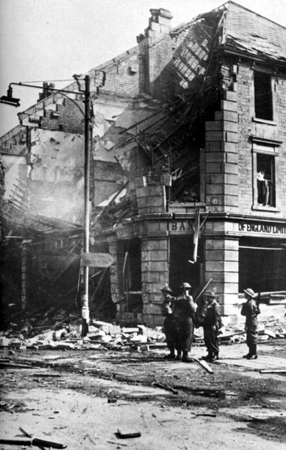 The Bear Pub, a Post Office and a few shops had been badly damaged on the first night so, as so often occurs in these circumstances, looters were expected. Our orders were to shoot looters on sight. Whether at sixteen years of age I would have done so, I do not know but as it was, there were so many bombs dropping that any would-be looters were not around. A unit of the Gloucester Regiment had been drafted into Bath after the first night. Whilst standing on guard at the top of Holloway, I will never forget lads of the Gloucesters carrying stretchers of wounded to St Martins hospital on Combe Down. A couple of them asked us how far it was to the hospital. One of these lads said that his officer had just had his head blown off. The night went on till I can't remember what time the bombs stopped falling and when it did, I and the lad who lived next door to me, also a young Home Guard, wended our way home to Odd Down picking up bits of shrapnel. I was never quite sure, and it is a long time ago now, but I don't think there was a shot fired in defence of Bath! (Below is another view of Bear Flat. The bank that Rex guarded was three shops further along than the furthest one visible in this photograph). Rex has remembered the address of the newspaper's office wrongly. Their offices were in Westgate Street. The picture of the Home Guard outside the bank was taken in daylight, so it is unlikely that any of the guards pictured is Rex, who guarded it at night. The officer of the Gloucesters who had "just had his head blown off" may have been the soldier who was killed while sheltering in the doorway of Magdalene Chapel in Holloway. According to other reports, three soldiers sheltered there. One was killed, one was injured, and the third was completely unhurt.